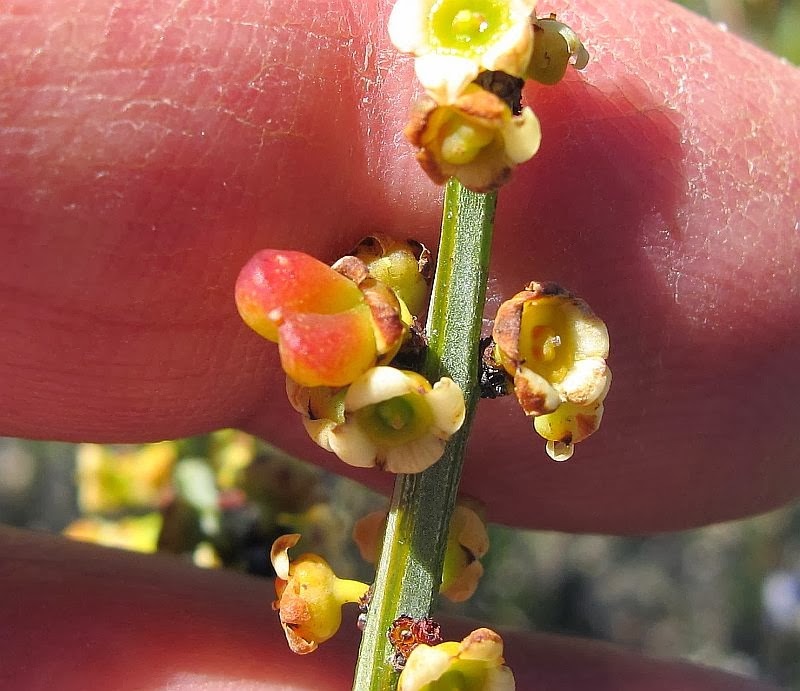 When I first saw this species, I immediately thought of the Choretrum plants from the root-parasite Santalaceae family, but when keyed out it was P. choretroides and only ‘like’ a Choretrum plant (oides = like). 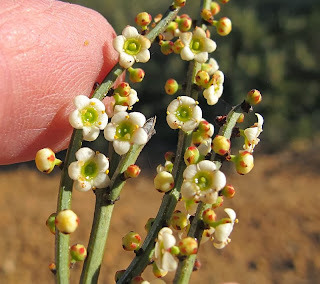 It is not a root-parasite, but related to the widespread Stackhousia (Creamy Candles) genus, although the Celastraceae (bittersweet) family has many genera with around 850 species worldwide. 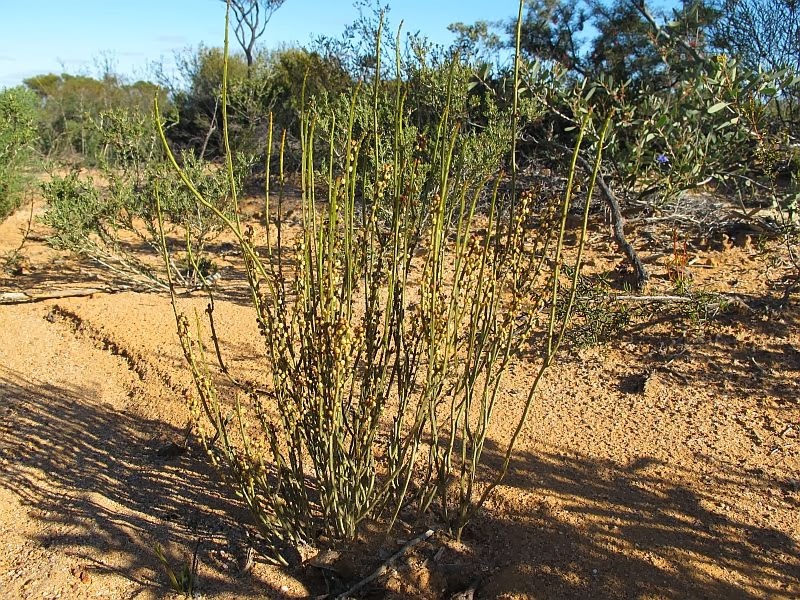 Psammomoya is a genus of 4 species and endemic to WA. 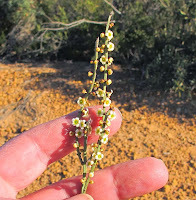 Three of these are located inland from the Kalbarri and Geraldton districts; P. choretroides occurs there too, but extends further east to Kalgoorlie, then south to Peak Charles (130 km or 80 miles NW of Esperance), returning west to Lake Grace then NW to the Moora district. 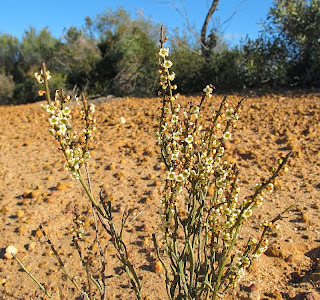 It is a sand loving species but locally is often found over a gravel substrate. 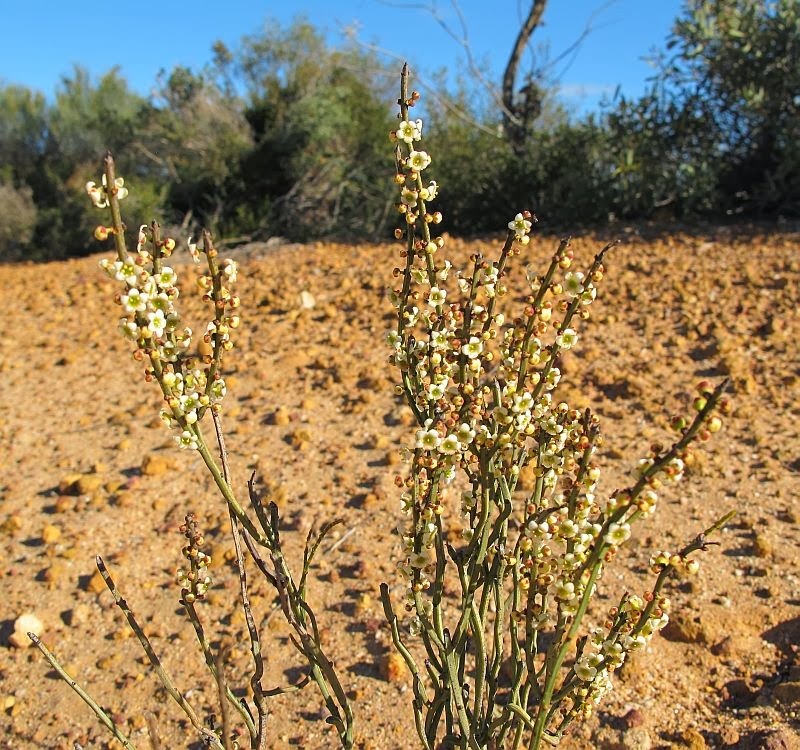 Around Esperance and for a considerable distance further west, there is only this Psammomoya species, but where they all overlap in the Kalbarri and Geraldton region it is closest to P. implexa. However that is more of a shrub and the branchlets are 6 ribbed, as against P. choretroides having only 4. 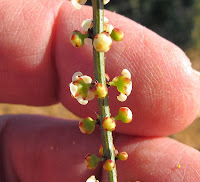 The other 2 species are P. ephedroides and P. grandiflora; the former with small flowers and sharply pointed branchlets, the latter having much larger flowers (6-7 mm in length) and soft tipped branchlets. 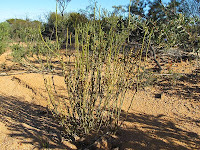 Psammomoya choretroides is a leafless broom-like shrub, growing to around ½ metre (18”) in height. Flowering is recorded from August to October (although locally it bloomed from July to September) after which a 2 locular capsule is produced. 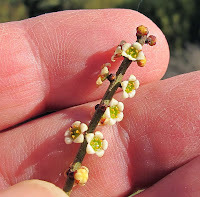 It is quite common in the described habitat off Cascades/Lake King Road in the Lake Tay Road region where it extends to the west. Psammomoya (Celastraceae), a taxonomic review by GJ Keighery. 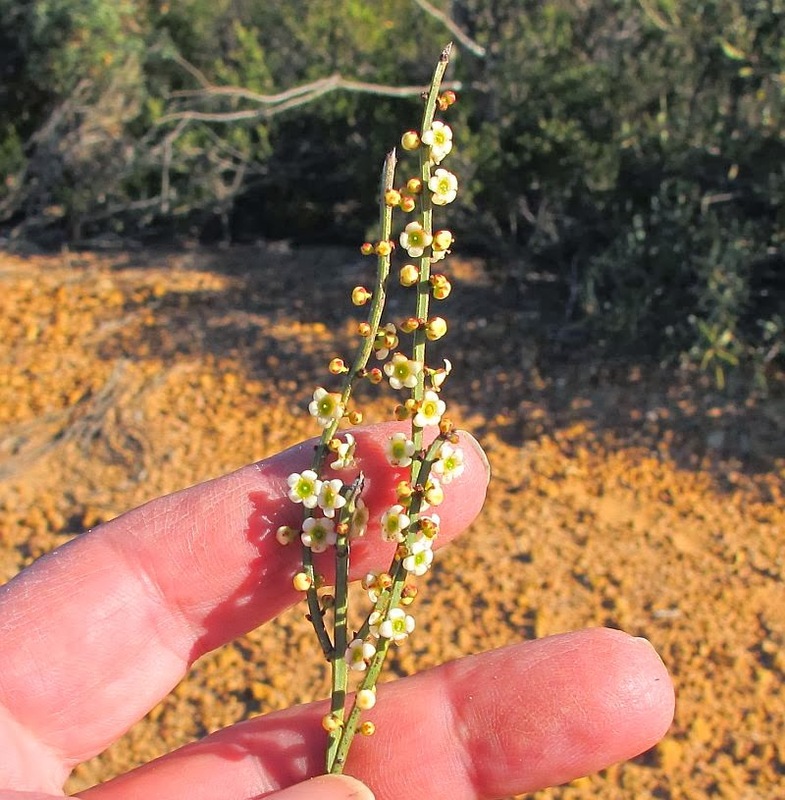 Nuytsia Vol 14. No 3. 2002.